Ah Christmas, the one holiday capable of convincing you, however briefly, that the winter is not such a bad thing. It's truly remarkable what consumerist cheer can do for both your morale, and your body temperature. 'Tis the season for caroling! Sugar cookies! Cuffing! Will Ferrel in tights! Unfortunately for Cambridgeshire, United Kingdom, it's also the season for rogue inflatable Santas. According to local news outlet, ITV, an enormous blow-up Santa Clause somehow unclasped itself from its moorings on Tuesday before tumbling into traffic on B198 Cromwell Road. While some cars were able to cleverly maneuver their way around the gargantuan Saint Nick, plenty were completely brought to a halt until the enormous bearded man was returned to his rightful place. 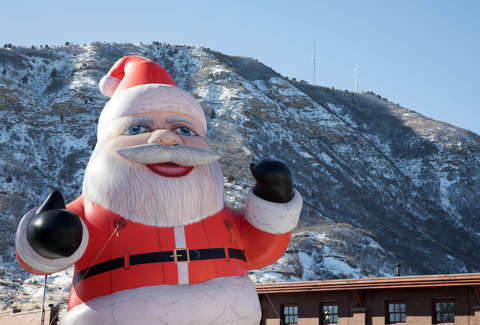 In the day's traffic report, local journalists cited slow traffic, partial blocks, and in all seriousness, a "large inflatable Santa on road." On the plus side, Santa has a full month to recover before the 25th, so he will, of course, still be available to bring you all the overpriced products you've been dreaming of. Here's to hoping he doesn't find himself face down in UK traffic come Christmas eve.